Joe Krcma from the Joe Makes channel on YouTube is 3D printing a huge Maker Tree. He asked that makers from all over the world submit ornaments for the tree, which will be given to The Kids Network. 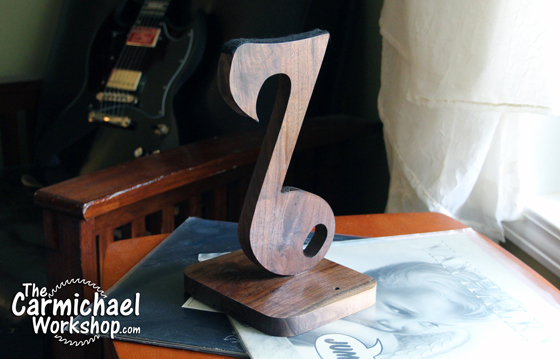 I thought it would be fun to make a miniature guitar ornament, so I designed one for the CNC machine. Check out my project video below, then click here to watch the playlist for the Maker Tree project. 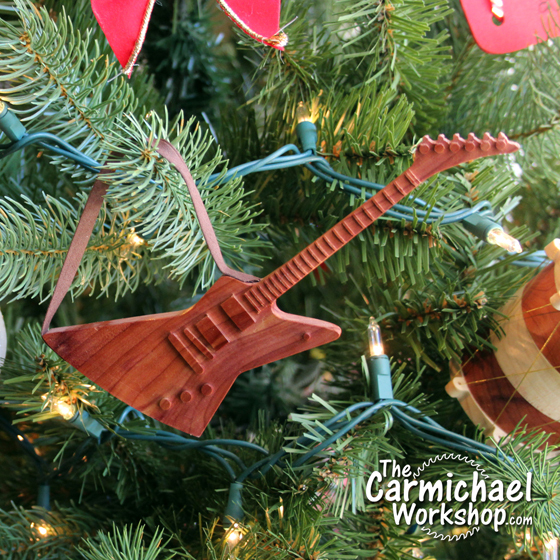 This guitar ornament is made from red cedar. I traced an image of the guitar in Microsoft Visio. 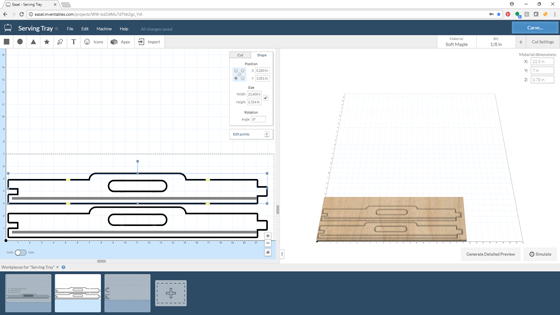 Then I exported it as an SVG file and imported that into the Inventables Easel software. I clicked on each object and set the depth of cut to add dimensions, then I sent it to the X-Carve CNC Machine to bring the guitar to life. I glued on a piece of brown material for a strap. Merry Christmas and Happy Holidays! Dave Gatton is hosting the 2018 Gatton CNC Christmas Challenge. I collect drum Christmas ornaments, but I don't have one made of wood, so I made one. Watch my project video below, then click here to view the other entries and subscribe to Dave's channel. Thanks to Dave and the sponsors for the challenge! 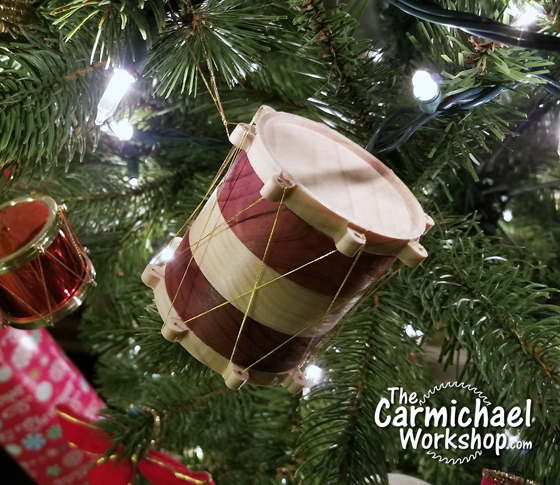 This Drum Christmas Ornament is made from poplar and red cedar. 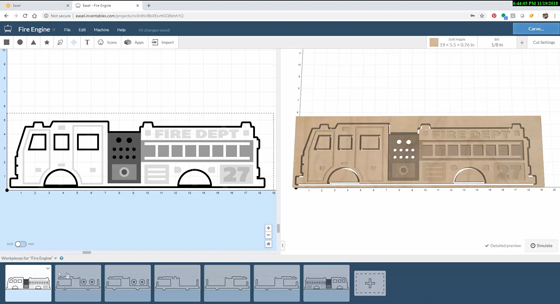 I designed the project in the Inventables Easel Software and cut it with the X-Carve CNC Machine. Click here to open my Easel project. I sprayed it with Satin Deft Clear Wood Finish Lacquer, then used three strands of gold thread in an X pattern around the drum (because the thread was so thin). I really like how it turned out. Merry Christmas, Happy Holidays, and Happy New Year! 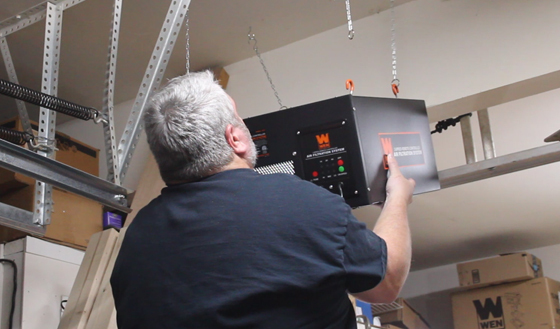 I bought a new WEN 3410 Air Filtration System for my shop. It cost $126 with free shipping so I couldn't pass that up. Check out my video of the installation then read further for more info. Installation could not be any easier. Pick a spot to hang it from the ceiling where it will be out of the way but near an outlet. The power cord is about 78" long. The instructions say to position it at least 3 feet from a corner. It is easy to move it to a different spot if needed later. It comes with inner and outer filters and all of the hardware needed to install it. Screw the wood screw hooks into the rafters in a 12"x14" rectangle pattern. Note that the hooks on the top of the unit are not centered on the unit, in case you are working around obstructions and need to hang the unit in a specific location. 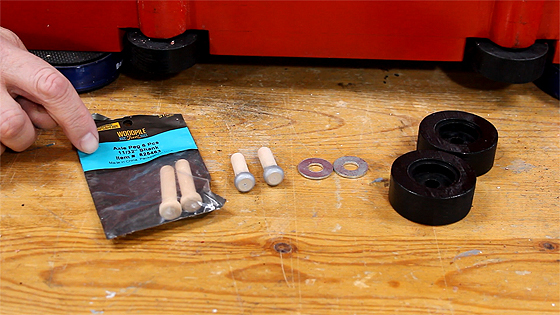 Thread the nuts onto the 4 rubber coated hooks and screw them onto the unit at about the same height. Tighten the nuts against the unit to lock them down. 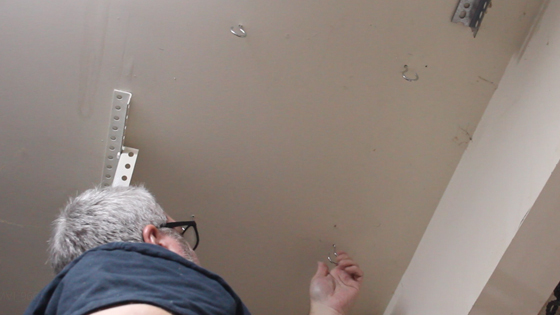 Hang the chains from the ceiling hooks, then carefully lift the unit and hang it from the bottom of the chains by the rubber coated hooks. Plug it into the nearest outlet. Insert the batteries into the remote control and enjoy your new clean air! Would you like the convenience of having your HVAC and shop air filters delivered straight to your home automatically when it's time to change them? 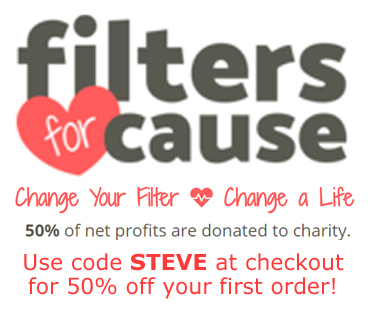 Sign up for the FILTERS FOR CAUSE service and use code STEVE at checkout to get 50% off your first order! Choose your filters from their long list of standard sizes or request a custom size, then select how often you would like them delivered. The best part is FILTERS FOR CAUSE donates 50% of their net profits to charity. Using affiliate links to purchase products or services helps to support what I do, and also supports the companies that are part of our maker community. Thanks for your support! My wife works for the local fire department and I thought it would be fun to make a wooden toy fire engine that she could display on her desk. 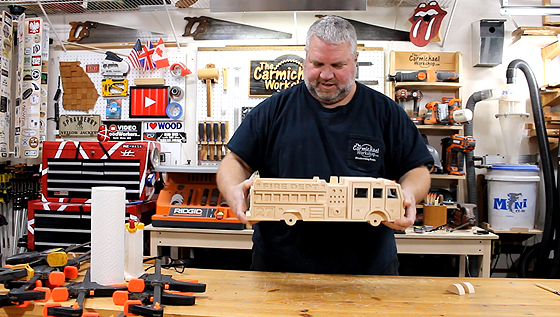 In this video, I used an X-Carve CNC Machine made by Inventables to cut seven sections of wood that get glued together to make up the body of the fire engine. Check it out and read further for more details. 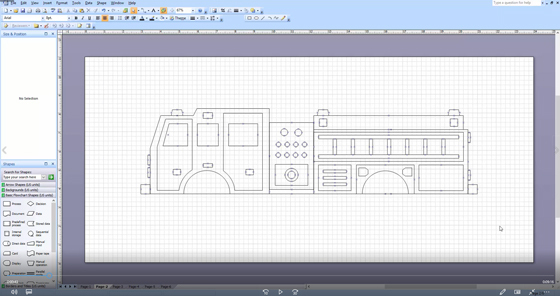 I used Microsoft Visio to design one side of the fire engine based on a picture of one at our local fire department. I copied this drawing and simply flipped it horizontally to create the right side. Then I designed five more sections that would be sandwiched in between. It was a fun challenge to see what details I could add by changing the outline of the cut. I added lights, axles, a back panel, and a mount for the water canon. I saved the designs as SVG files and imported them into EASEL. Did you know you can create a free EASEL account and open my Fire Engine project to see how it is designed? 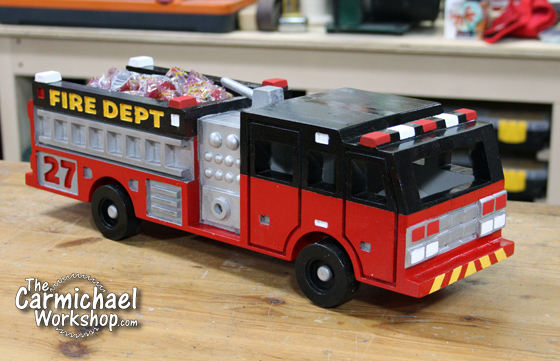 Click here to open my EASEL Fire Engine Project. 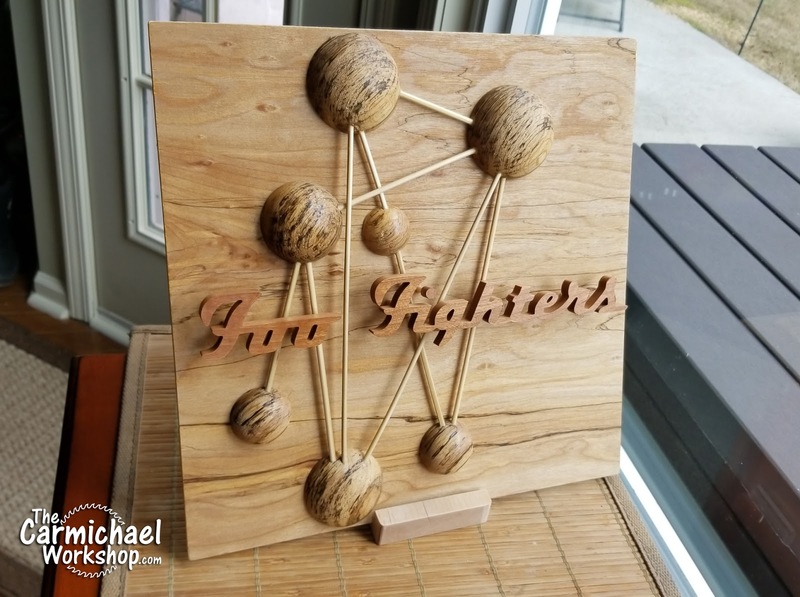 The accuracy of the X-Carve CNC Machine really shines on a project like this. Each piece was precisely cut and lined up perfectly with the others. I used brad nails to help keep them aligned during assembly. Very little sanding was required to smooth out the joints. I purchased 1/4" and 3/8" Furniture Buttons from the hobby store to use for gauges. I planned ahead of time and included the correct size holes for these in the design. I also purchased 11/32" Axle Pegs from the hobby store to hold on the wheels. The correct size holes for these are in the axel design where the wheels are attached. The wheels have a slightly larger hole in them so they will spin freely. A washer is used as a spacer between the wheels and the fire engine. I used Metallic Silver, Gloss Apple Red, and Gloss Black spray paint to paint the larger sections of the fire engine. Acrylic paints from the art store were brushed on for the details. It took several coats of paint to cover the base colors. This is a great project for practicing painting. My wife really likes the fire engine. I wonder what the other people at the fire department will think of it. Perhaps they will enjoy the Atomic Fireballs that are stuffed in the back compartment! Thank you to all of the Fire Department Personnel out there who have committed their lives to helping people every day! 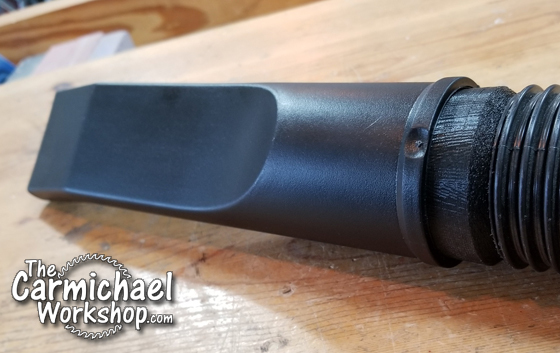 In this Sidebar Convo Shop Update, I talk about my latest Bluetooth Speaker project, where I buy my lumber, a new HomeRight Finish Max Sprayer, an update on my weight loss journey, and making another electric guitar! Below are links to stuff I mentioned in this Sidebar Convo! Sign up for my newsletter on the right side of my website! Get $5 off a $50 order from www.PartsExpress.com using code CWFIVE at checkout. My local lumber supplier is Suwanee Lumber North of Atlanta, GA. Thanks to HomeRight for sending me a finish sprayer and accessories to try out: Super Finish Max Sprayer, Spray Shelter, and their new Turntable. I've lost about 30 lbs on my weight loss journey. The Lose It calorie counter app has helped. 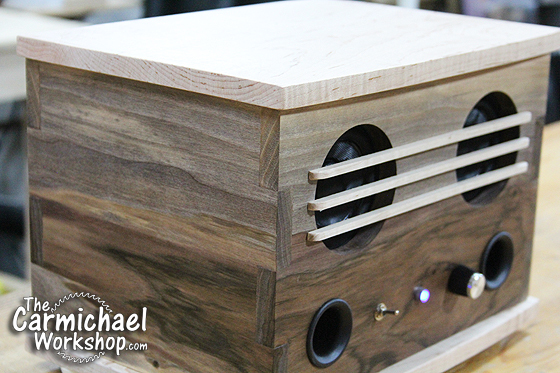 Make a Custom Bluetooth Speaker! 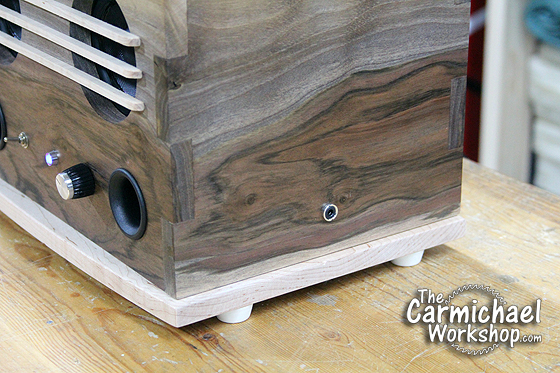 A Custom Bluetooth Speaker is a great project for getting people of all ages interested in woodworking, since everyone is so attached to their phones. They also make great gifts. 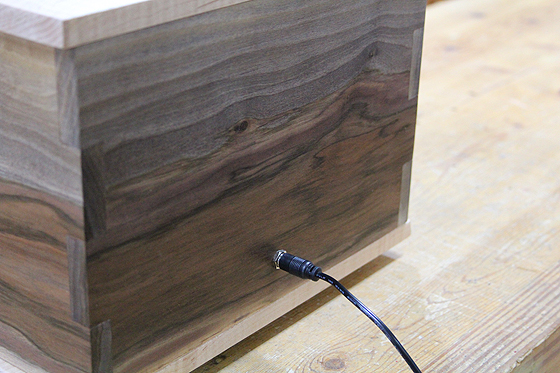 Watch my video to learn how to make one out of 1/2" walnut and maple, then make one yourself! 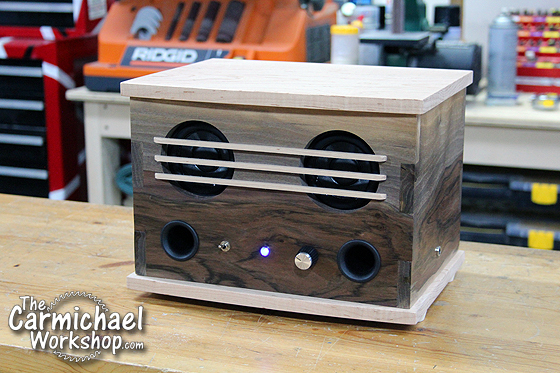 Click here to see the kit that I used to make this Bluetooth Speaker. They recommend an enclosure with internal volume of 0.3 cubic feet, or 518.4 cubic inches. My design has internal dimensions of 10"x7"x7" which is 490 cubic inches. Although it is slightly smaller, it sounds awesome! Click here to download my plan for this project. The kit comes with everything you need, except for the suggested two 1" Speaker Port Tubes (Part #260-470) which are sold separately. 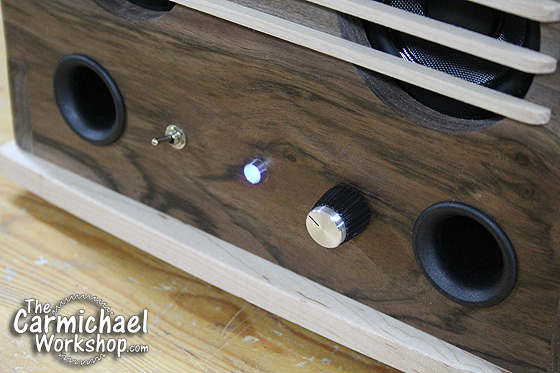 I also ordered a nicer Amplifier-Style Volume Knob (Part #240-2206) that looks really classy. An Audio-In jack is included in the kit. I mounted this on the right side of the speaker so it is easily accessible. This jack allows you the option to connect an external device using a 3.5mm audio cable, such as a CD player. I mounted the power adapter jack on the back so it is out of the way and not visible. The power adapter is also included in the kit. I bought a set of four rubber feet from Ace Hardware. They come with really short screws, so I chose to use longer 1.25" screws that will secure the feet and the bottom to the enclosure. 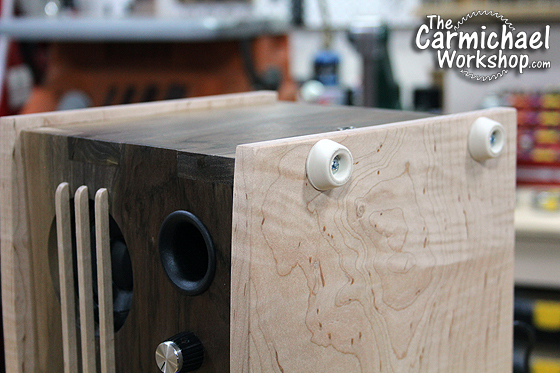 Make sure you drill pilot holes in the sides to avoid splitting the wood. 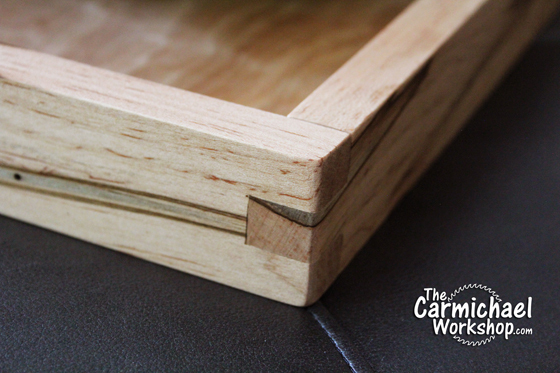 I used the cutting templates in my plan to cut the mating finger joints on the corners with a scroll saw. This worked out great. Just make sure to cut out the correct pieces so all sides mate up correctly. Also check for square when gluing it together. 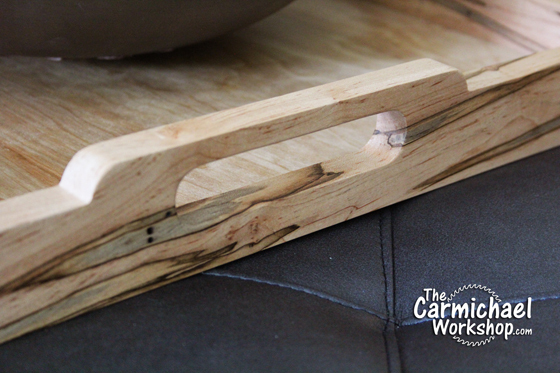 This was a fun project to make and perfect for Scroll Saw users. I hope it inspires you to make one too. Rock on! Wiring Tip! 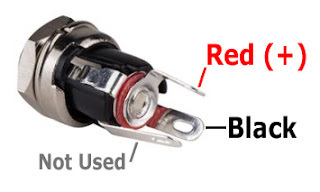 The picture below shows where to attach the red and black wires to the power jack for the kit I used. Connect the red wire to the terminal on the end of the center post. Connect the black wire to the middle terminal. The other terminal is not used for this kit. 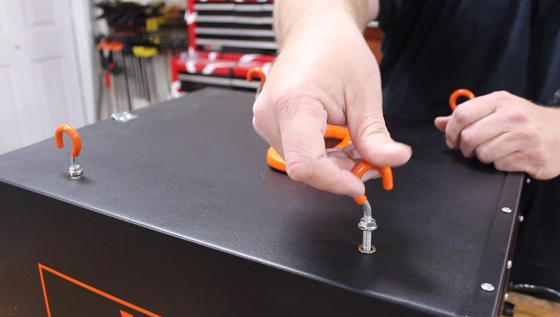 Use electrical tape or shrink tube to isolate each connection from touching each other. 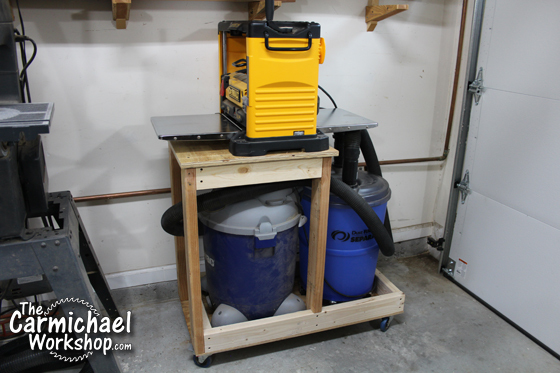 I made a mobile stand to hold my Dewalt Planer with a Shop Vac and Dustright Separator underneath. Check out the video to see how I made it. 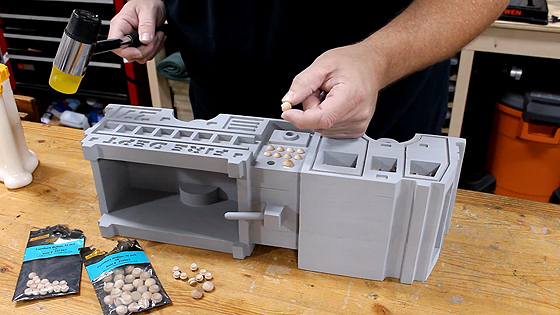 This compact space-saving design allows me to always keep my planer set up and ready to use. I measured carefully to make sure the Dustright Separator with hoses connected would fit underneath the fold-out planer table. I did not extend the table top above it so that I could easily empty the bin when it's full. 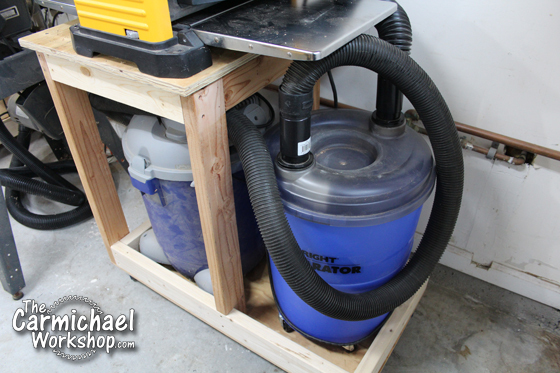 I made the compartment for the Shop Vac as small as possible while still allowing me to remove it if necessary. 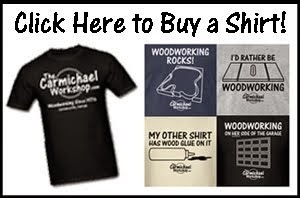 Clicking affiliate links above to make any purchase supports my shop without affecting your purchase price. It's been 8 months since my last shop update, so I have a lot to catch up on. In this video, I talk about my latest project videos, some new products I like, and what's going on in the shop. I need to start posting these updates more regularly than every 8 months, LOL. Below are links to the different sites and products I mentioned in the video. Check them out! 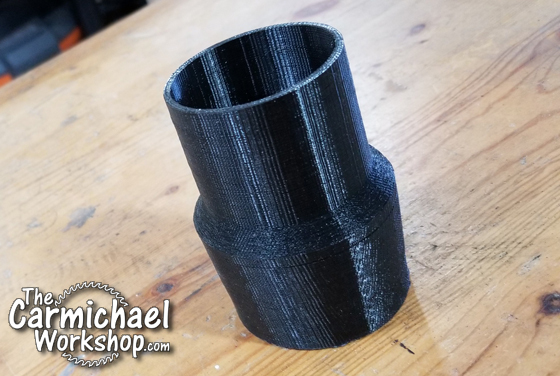 Make a Shop Vac Hose Adapter with Fusion 360 and a 3D Printer! Trying to find the right size adapters for shop vac hoses is so frustrating! I don't think the size I need even exists, so I set out to design it using Fusion 360 so I can print one on my Prusa i3 3D Printer. Check out the video below to see if it worked! This was a very rewarding project. I had never used Fusion 360 before and only printed a few small objects from Thingiverse on my 3D printer. Now I feel confident that I can design and 3D print any parts that I need. It's always awesome to learn a new skill. The adapter connects really well with a nice friction fit in both ends. One end goes into the vac hose and the other end accepts the vac attachments. It worked! Click here to get the files from Thingiverse. Click here to for the 20' hose that I cut in half. I would like to thank Bob at I Like to Make Stuff for sharing his knowledge in the video below. This gave me a great head start for making my own. Using affiliate links to purchase items from Amazon helps support my shop. Thanks! 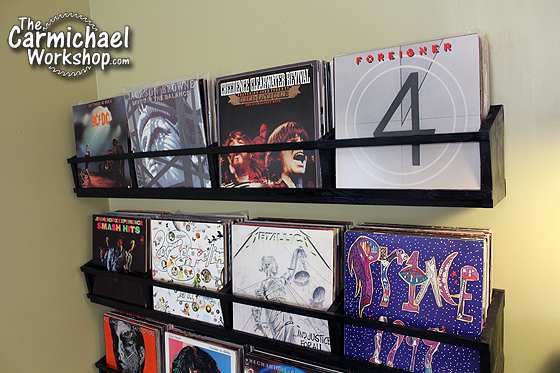 We have a large vinyl record collection that has been stored in crates and taking up floor space. 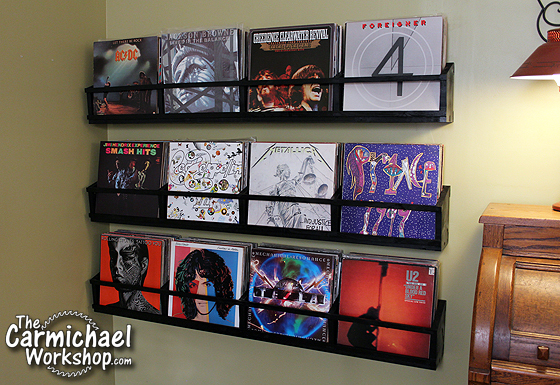 I made three display racks so that we could mount 180 lbs of vinyl records on the wall. Watch my video below, then continue reading to learn more about this project and download the PDF plan. Vinyl record albums are very heavy. I used 1x6 lumber for for the base of the shelves, so about a 5-inch thick stack of records would fit comfortably with some wiggle room so we can flip through the records. I fastened the display racks securely to wall studs with several long screws and washers to hold the weight. Each 5-inch stack of records weighs about 15 lbs. Each rack holds four stacks for a total of 60 lbs of records. I made three racks, so that adds up to about 180 lbs of vinyl record albums. Wow! 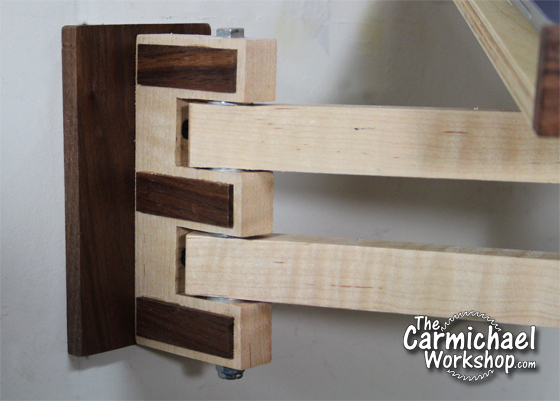 Here is a close-up of the end of one rack so you can see how the pieces are joined together. 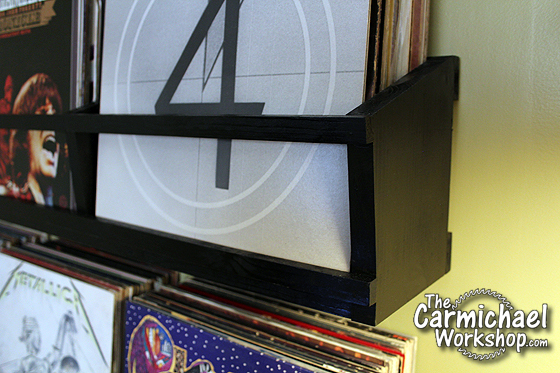 If you would like to make these display racks, click here to download my PDF plan. 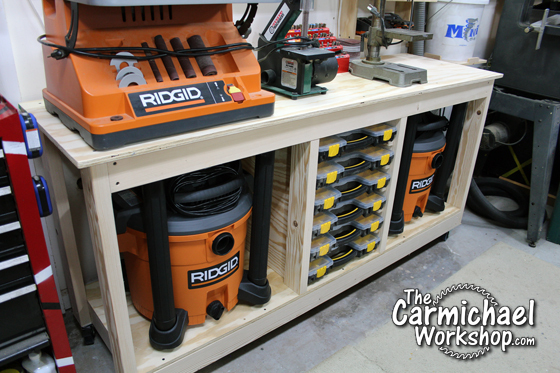 I designed this Easy 2x4 Workbench to organize my two new Ridgid 12 WD1280 gallon shop-vacs and six Harbor Freight hardware organizers. It's a simple design that can be made with just 2x4s and plywood. Watch my video then click here to get the plans! 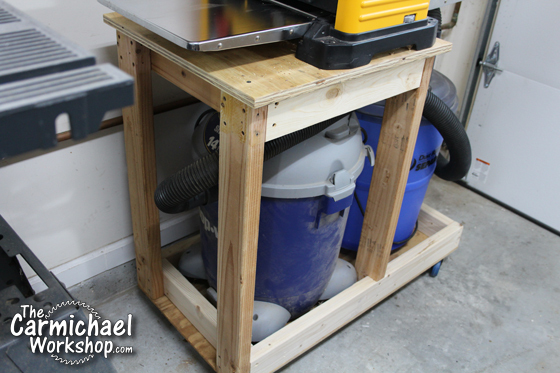 This workbench is mobile and great for a small shop. 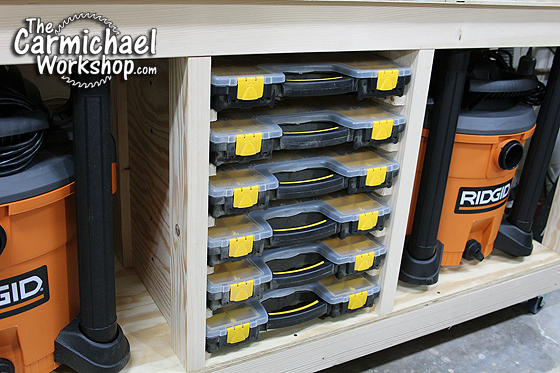 It can be customized to organize a variety of tools and storage bins. The six Harbor Freight Hardware Storage Bins sit on runners. I could probably fit another bin in there if I tightened up the space a little. I used 3" casters from Harbor Freight that have an overall height of 3.75". 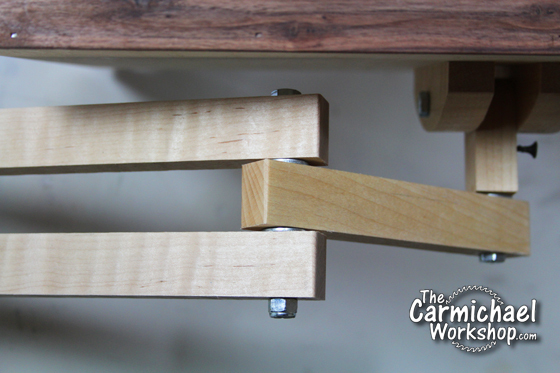 Keep in mind that using different size casters will change the overall height of the workbench. 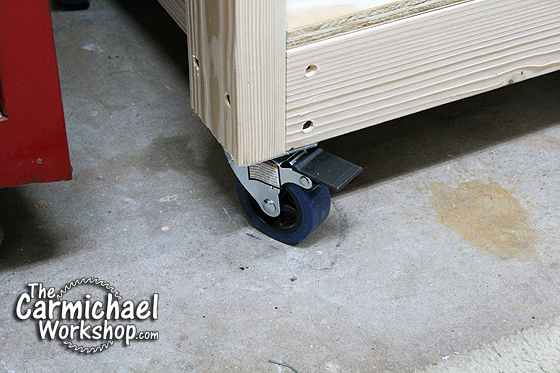 I recommend casters with brakes to keep the workbench from moving. Click here for a similar set of casters with 4" overall height on Amazon. 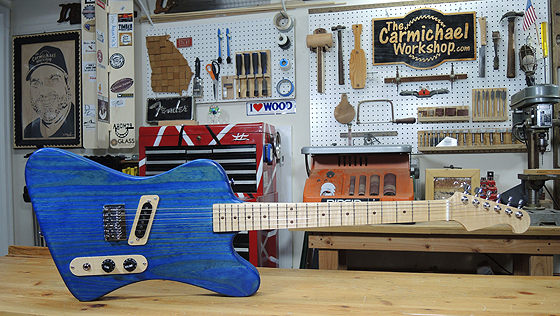 If you would like to build one too, click here to get the plans! The plans include a materials list, measured drawings, cutting layouts, 18 photos, and 8 simple step-by-step assembly instructions. I did my best to make it easy to build this project in one weekend. It's a very sturdy bench and I plan to make more for my shop. Inventables is hosting an Easel Power Hour Challenge contest during the month of June 2018. They are giving away gift cards and an X-Carve CNC Machine. 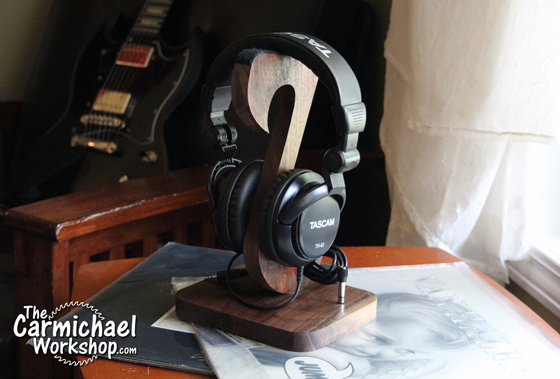 In this video, I make a Headphone Stand as an example of a project that can be designed in their Easel software and carved in less than an hour. 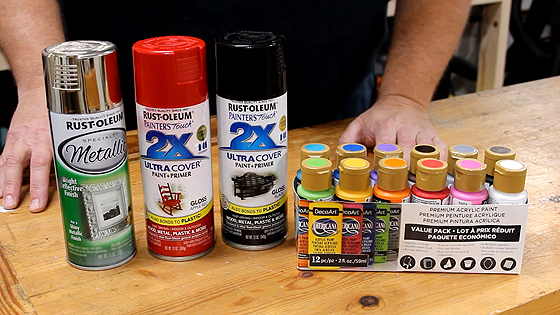 Watch my video, then visit the Easel Power Hour Challenge page on the Inventables website for the contest rules. Good luck! The Headphone Stand looks great in my office. 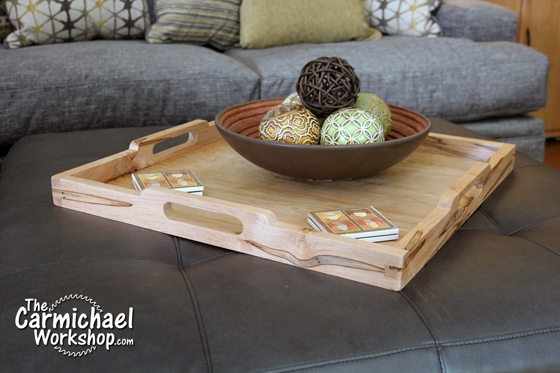 This project can also be made using a scroll saw or other tools. Click here to download my PDF cutting template. 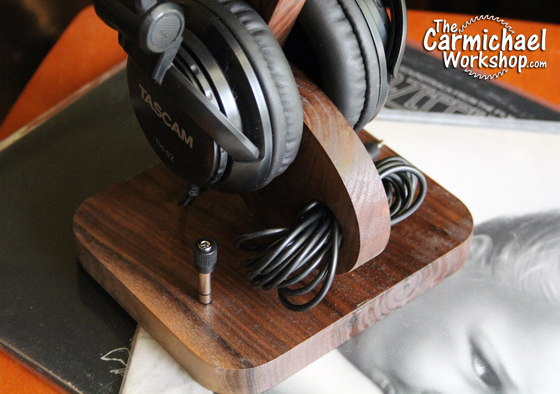 The headphone cord inserts perfectly into an oblong hole on the stand to keep it nice and tidy. Plus, even the 1/4" adapter plug has a home. 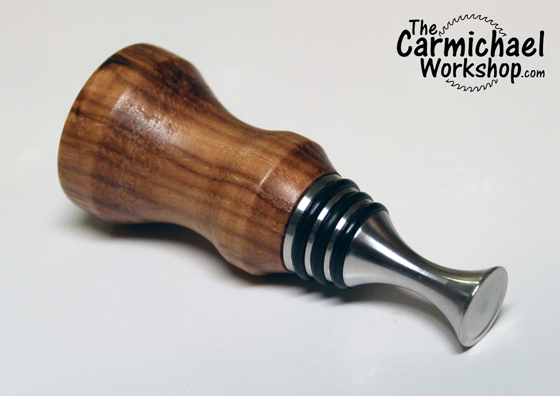 Make a Wooden Wind Spinner! 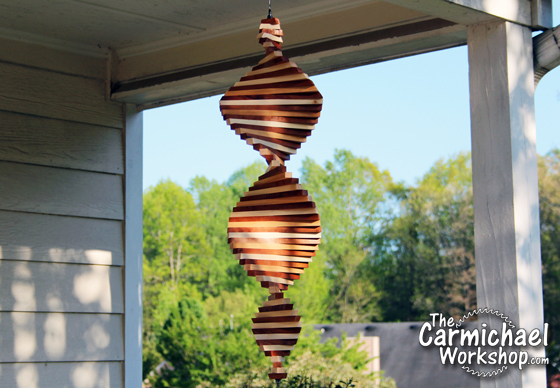 I made a wooden Wind Spinner to hang on our front porch. 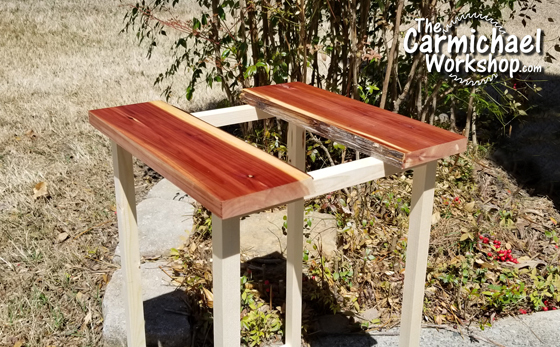 This is an easy Spring/Summer woodworking project that you can make in one day. I tested it using the free WindPro18 18" Shop Fan that NewAir sent me. Check out the video below. If you need a good shop fan, check out the NewAir WindPro18 18" Wall Fan and get 15% OFF with promo code STEVE. 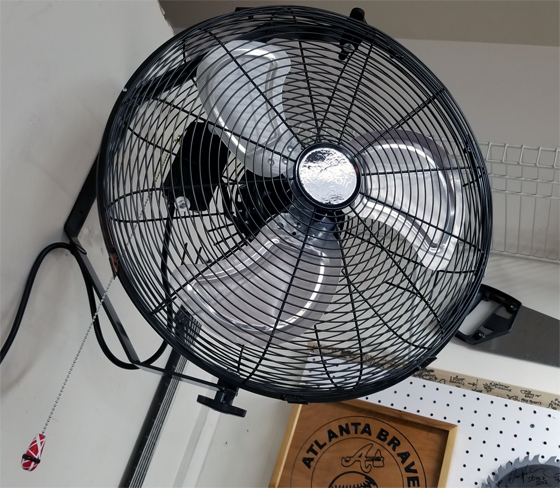 This fan has 3 speeds and puts out a lot of air for a nice cool breeze in the shop. It can be mounted on a wall or ceiling to save floor space and it is quiet enough to have a regular conversation. It easily made my Wind Spinner spin from about 15 feet away. It comes with some mounting hardware and a pull chain extension, but I had to make my own Van Halen striped pull chain. The weather is finally warming up here in Georgia, so I put the Wind Spinner outside under our front porch. It is fun to watch it twirl and the neighbors love it too! Now go make one yourself and impress the neighborhood, but don't be surprised if you are asked to make some more! For this year's April Fools video, I made this Live Edge River Table using hydrogen and oxygen. It is unlike any other river table that you've seen before. Check out my video of this project below and I hope you get a laugh or two out of it! Here is a close-up picture of my Live Edge River Table. It's awesome! 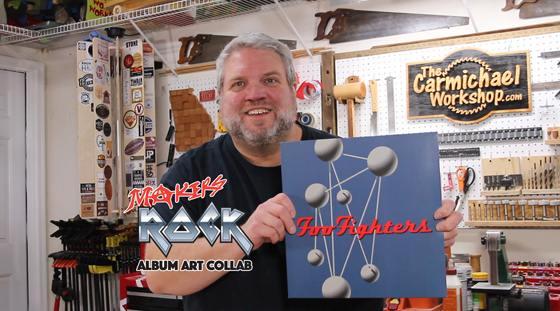 I reproduced the Foo Fighters' "The Colour and the Shape" album cover out of wood for the 2018 Makers Rock Album Art Collaboration on YouTube! Check out my video and enter my giveaway for a chance to win this artwork. Don't forget to look up the other participants' videos and giveaways too! Here is a picture of the album artwork I created next to the original cover. I think I got pretty close. This was a fun project to make and I can't wait to do another album next year. If you are interested in the next Makers Rock event, keep an eye on the Makers Rock Website for updates. Enter for a chance to win this album artwork in the Rafflecopter widget below (for USA residents ages 18 and older only). The deadline to enter is March 24, 2018 at 11:59pm Pacific time. A winner will be selected on March 25th and automatically displayed in the Rafflecopter widget below. Good luck! This giveaway is not associated with Google, Blogger, YouTube, Facebook, or Twitter in any way. The Makers Rock Album Art Collaboration is coming March 20th on YouTube. This time about 35 woodworkers/makers are reproducing 90's rock album covers and giving them away! I'm making the Foo Fighters' "The Colour and The Shape". Watch my announcement video for more info, then subscribe to all of the channels listed below so you can see all of the cool projects. Subscribe to the channels below so you can see all of the 90's rock album art project videos and enter for a chance to win the giveaways! 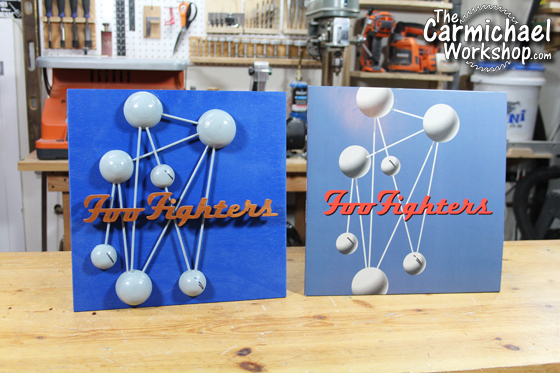 Watch my channel on Tuesday for this Foo Fighters album made out of wood and enter my giveaway here on my website! I made a wall mount for my 17" HP laptop. It has an articulating arm for a wide range of motion for positioning the laptop. Watch the video below and if you would like to make one too, click here to download the PDF plan. I made this wall mount using some scrap maple, walnut, and Baltic birch. 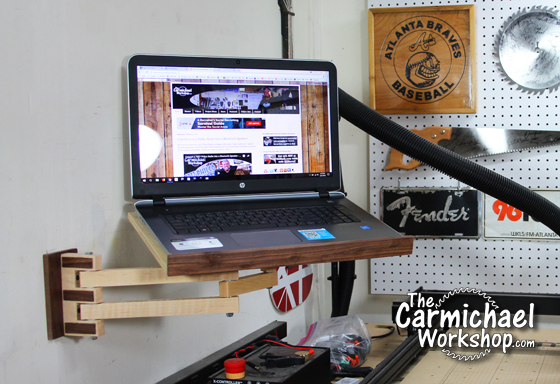 It is nice to have a dedicated place for my laptop in the workshop when running the CNC machine or just watching YouTube videos. The hardware is readily available at the big box store. 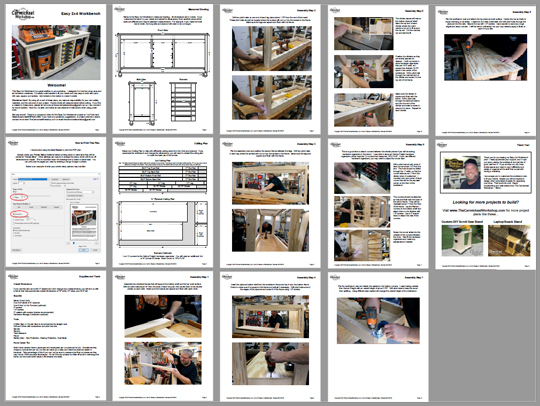 All of the details about the hardware I used are in the PDF plan. This wall mount is perfect for my 17" laptop that weighs about six pounds. If you will be mounting a larger or heavier laptop, I suggest making a more beefy mounting arm.